je doelen van morgen te realiseren! Start met jouw gewenste uitkomst: je doel en het plan met de benodigde stappen. Met behulp van deze actie-planner weet je automatisch wat écht belangrijk is om te doen vandaag. Met unieke 13 weken omruilgarantie! Wat een geweldige planner. Het is net of Tanja in mijn hoofd gekropen is en precies begrepen heeft wat ik als zelfstandig ondernemer nodig heb! Deze planner raad ik echt iedereen aan! I have been using the Day By Day journal from betterjournaling since March 1st and I love it. Planning out my goals for the year/month/week has massively increased my focus and helped me get so much more done – I’m working smarter, not harder! If anything I’ve got more time to do the things I love. 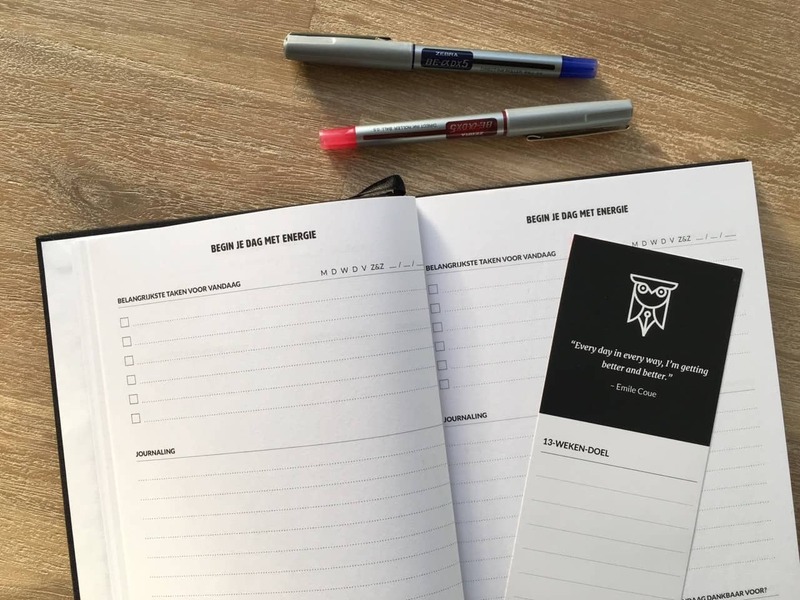 De 13 weken actie-planner Day by Day is het eerste product in de BetterJournaling® Suite, een collectie van productiviteits tools. Ontworpen voor drukke freelancers en ondernemers die hulp in de vorm van structuur kunnen gebruiken. Om naast je drukke werkzaamheden óók te bouwen aan de toekomst van je onderneming (en jezelf). The act of writing, as opposed to typing, requires a different connection in your brain, allowing you to be more creative and “dig deeper”. Just spend 5 to 15 minutes a day reflecting on your day and your progress. Plan your tasks for tomorrow to ensure you reach that one overarching vision for you or your business! Keep track of your daily and weekly wins. Having that reminder allows you to celebrate just how awesome you really are! Day by Day, the 13 Week Journal, was prompted by the question, “what could I accomplish in one year, and what would I present at the end of it?”. Having a clear vision allows you to channel your ideas, and intuitively know which ideas will contribute to realizing your vision; and which ones are best left on paper (and out of your head). Keeping ideas and recurring questions in your head will eventually limit your progress. Your brain will feel as though it is just overflowing, and this action alone will take too much capacity to process from your brain! Writing down these questions, answers and ideas will not only clear your brain; but, start to develop what you need to do to reach your vision. All you need to do is make yourself have time of both a morning and an evening to keep yourself on target!